I'd like to take a moment of your time to explain why there is a fairly decent chance you will not get my business again. It is not because your company provides poor product. I LOVE your HD DVR. My family has enjoyed your satellite based television service since 2007. As your customer service reps always reminded me, I always felt like a valued customer. That was until I decided to no longer be a customer. This had NOTHING to do with your service or product. In seven years and one move from one house to another, we loved having you. However, this past year we made the mistake of bundling your services with a well known internet service provider. The deal was good, but the ISP was terrible. We were locked into an internet provider that was terrible. We suffered through it but as soon as we could unbundle and then replace the ISP, we jumped on it. 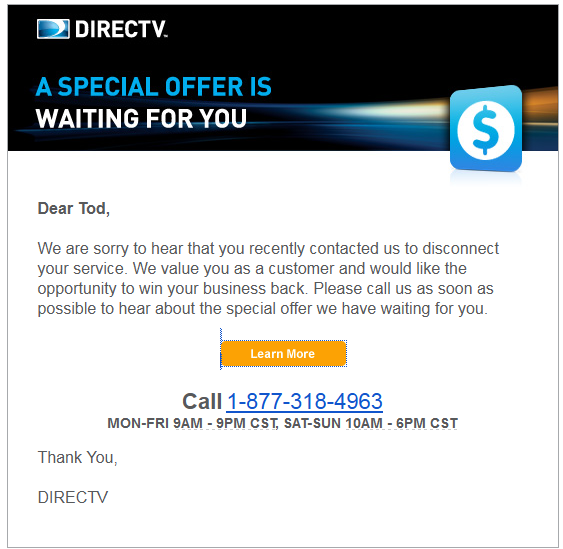 The only other decent internet provider in my area offered an insanely good deal on internet and television service. I was torn. My family was torn. We like Directv products. I've called about problems with service and always liked your customer service reps and the response we got. But the basic truth was: we found a better offer. We even tried the TV and internet provider before we finalized our decision. So, I called several times to see what your company could do to keep my business. The first time I was told nothing. Then when I finally called to pull the plug, I got the standard "oh won't you please stay" kind of spiel. I can live with that. No one wants to lose a customer. However, the desperation I was pummeled with in the last week since I pulled the plug has reached it apex when I got the email in the photo above. I received at least three phone calls from your reps. The last of which I finally answered. It was the same questions about why I was leaving during my call with your rep.
To be clear, they were all professional, nice, and scripted. What I have come to expect with your calling center folks. That does not negate the fact that it was pretty much HARASSMENT at that point. I said I was leaving and told your folks why. You are coming off as the desperate ex now. To illustrate, allow me to back up. When I first called to discuss options, I was told that I could save $10/month for the next year. No reason, just arbitrarily I would get this discount. I saw recently that you said before a Boston crowd that "... DirecTV spends $1,000 to wire a new customer's home, so new customers aren't profitable until after more than three years of paying for service." Granted, I have not had my latest iteration of your service for three years, but according to your math I've paid for the wiring more than twice. I guess this is why your reps can just drop my bill willie-nillie? When I made the final call, I was also told that there were other options that could be done and I even have this last email to illustrate your desperation. At this point, I have to wonder "How much was I over paying for this service when it could so easily be discounted." I don't really expect an answer. I may finally get over this if I ever move and have no other choice or my current provider just does not earn my trust. I can tell you though, after seven years of trust, you lost mine when you lost this customer. You can comment on here, or feel free to email me at tlyden@gmail.com, as I would love to hear how you might change your processes.